Designed by KlingStubbins in 2003, the hotel tower contains 36 stories and rises 475 feet (145 m). KlingStubbins is an architectural, engineering, interior, and planning firm headquartered in Philadelphia, Pennsylvania, with offices in Cambridge, Raleigh, San Francisco, Washington, D.C., and Beijing. KlingStubbins was formed through the merger of two offices. The first, The Kling-Lindquist Partnership, Inc., was founded by Vincent Kling in 1946, and grew to become the largest firm in Philadelphia. One of the most recognizable buildings designed by Kling is the Bell Atlantic Tower, which was completed in 1991 and remains among the tallest buildings in Philadelphia. Kling also collaborated with Philadelphia city planner Edmund Bacon. The Stubbins Associates was founded by Hugh Stubbins, FAIA, in 1949 and based in Cambridge, MA. Hugh Stubbins had designed several of the world’s most noted skyscrapers, including the Citicorp Center in New York City, the Federal Reserve Bank of Boston headquarters in Boston, and the Yokohama Landmark Tower, the tallest building in Japan. Kling became affiliated with The Stubbins Associates in 2003, and the two officially merged on January 1, 2007. The company has grown to include engineering, interior design, landscape architecture, and several branch offices in other cities. In 2011, KlingStubbins was acquired by Jacobs and operates as part of their Global Buildings sector. 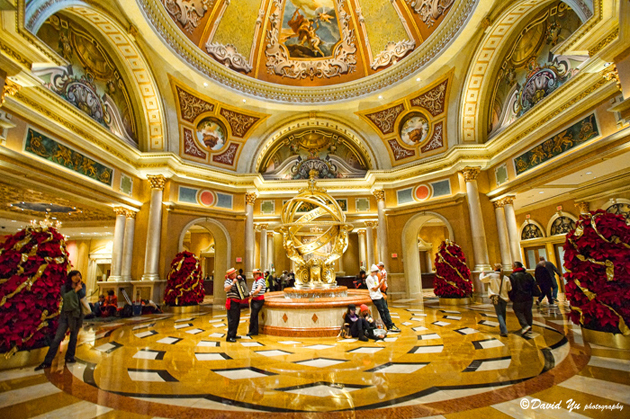 The Venetian is owned and operated by the Las Vegas Sands Corporation and serves as the seat of the corporate headquarters for its parent company. 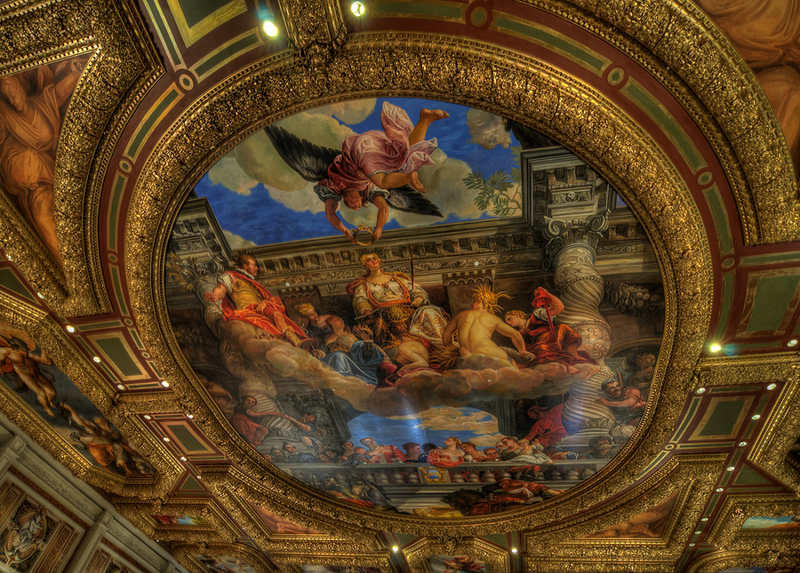 Ceiling View of Venetian luxury decorations: The centerpiece of the Grand Canal Shoppes entrance hall ceiling. 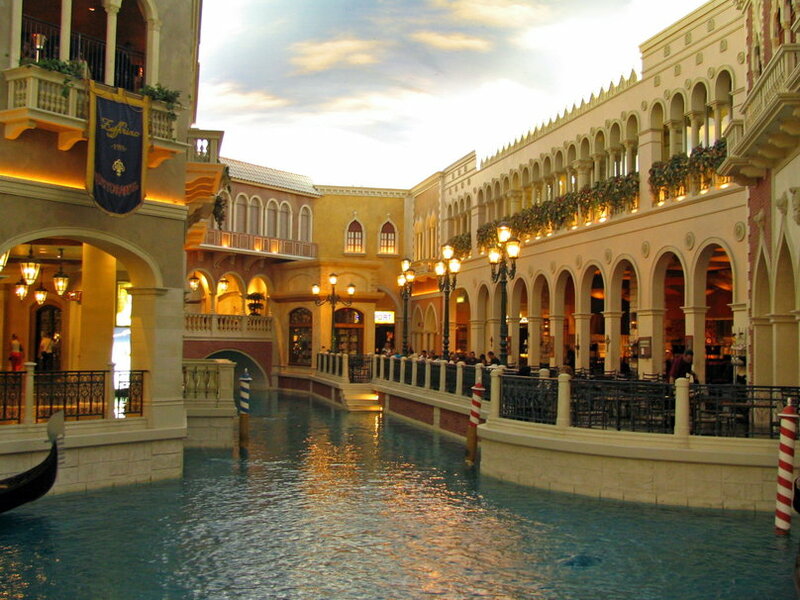 The hotel uses Venice, Italy as its design inspiration and features architectural replicas of various Venetian landmarks, including the Palazzo Ducale, Piazza San Marco, Piazzetta di San Marco, the Lion of Venice Column & the Column of Saint Theodore, St Mark’s Campanile, and the Rialto Bridge. The design architect for this project was Steelman Partners. Interior design was provided by Dalton, Steelman, Arias and Associates. 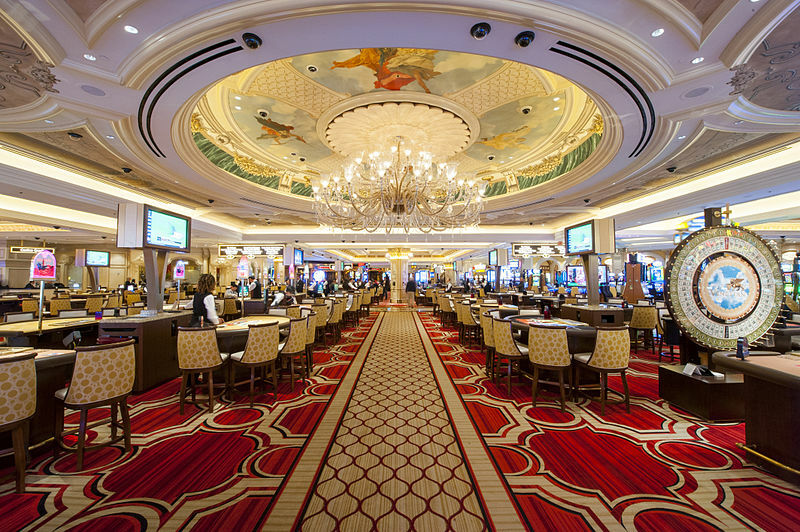 Shop12 designed interior lighting of the casino renovations and Cantor sports book. 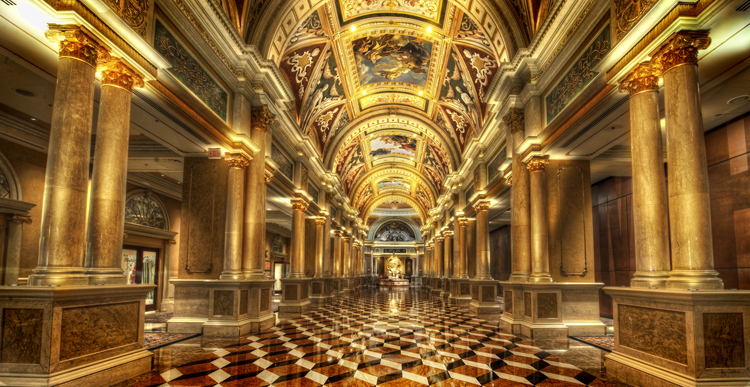 This grand gallery connects the reception area and the casino. 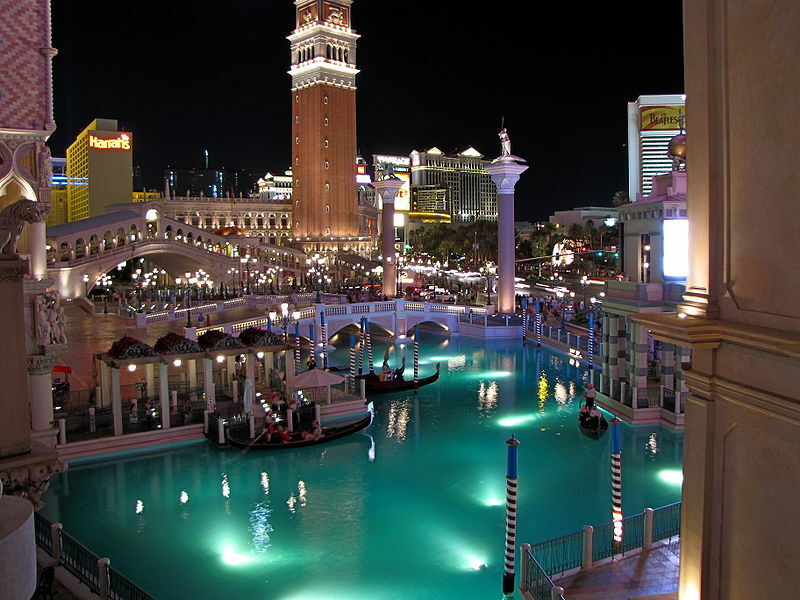 The Venetian Resort Hotel & Casino offers a full quota of dining, gaming and relaxation choices. There’s also a business center with meeting rooms for those who are in Vegas to work rather than play. The Venetian Resort Hotel Casino is a luxury hotel and casino resort situated between Harrah’s and The Palazzo on the east side of the Las Vegas Strip in Paradise, Nevada, United States, on the site of the old Sands Hotel. Designed by KlingStubbins, the hotel tower contains 36 stories and rises 475 feet (145 m). 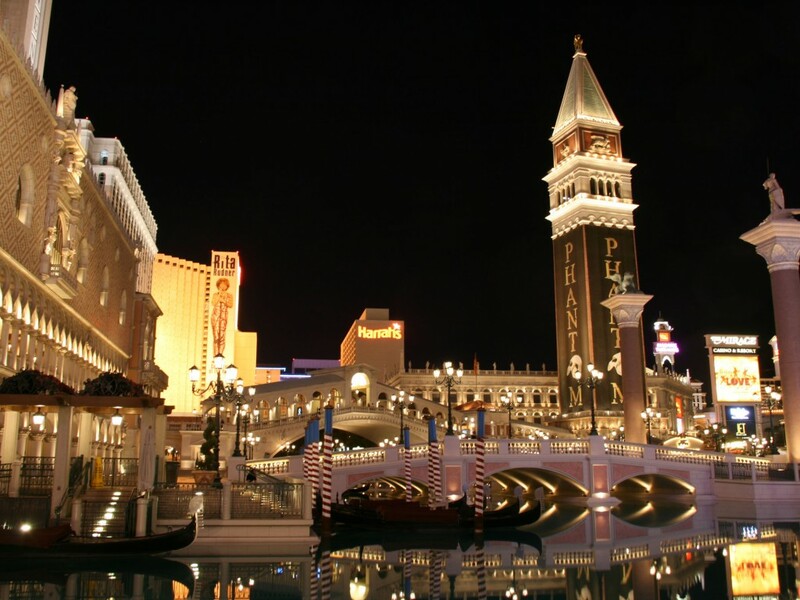 The Venetian is owned and operated by the Las Vegas Sands Corporation. The Venetian also serves as the seat of the corporate headquarters for its parent company. 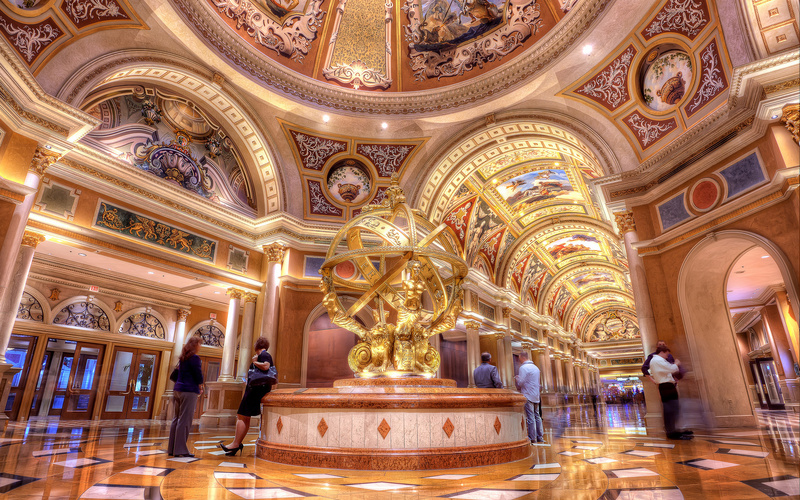 The Venetian is (along with the adjacent Sands Expo Convention Center and The Palazzo Hotel and Casino Resort) part of the largest five-diamond hotel and resort complex in the world with 4,049 suites, 4,059 hotel rooms, and a 120,000-square-foot (11,000 m2) casino. 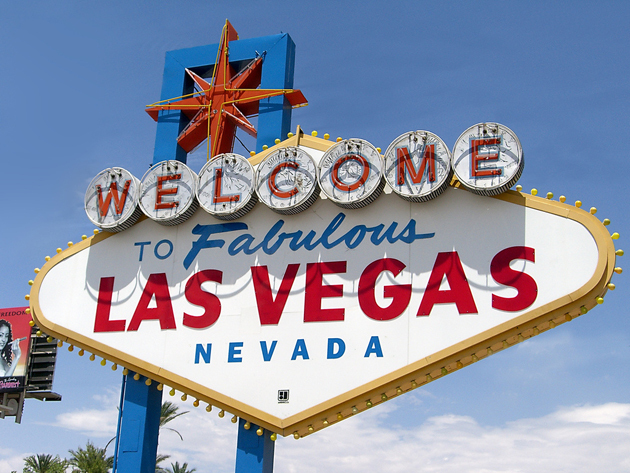 It is, after all, truly magnificent, and one of the staple sights that the Strip has to offer. With its pseudo-Italian classical architecture (inside and out), azure waterways and gondolas, The Venetian incorporates everything that there is to love about Venice with some good ol’ razzle-dazzle. The five-acre pool deck includes three pools, a café, hot tub and cocktail service as well as pavilion beds and cabanas. 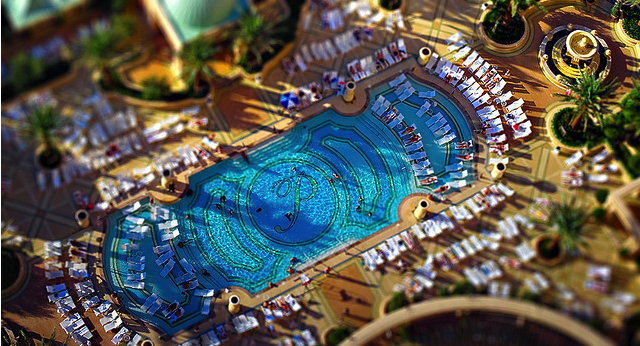 The Venetian Las Vegas pool is set among lush gardens reminiscent of old-world palaces. Located on the third floor of the deluxe resort, the pools at the Venetian Hotel are close to all of the action inside the Las Vegas resort, including the suites and restaurants. Guests have access to three different pools at the Venetian Hotel, where they can swim laps, go for dip, or just enjoy the comfortable water. The lounge pool, only a foot deep, is perfect for relaxing and dipping your toes in the water. 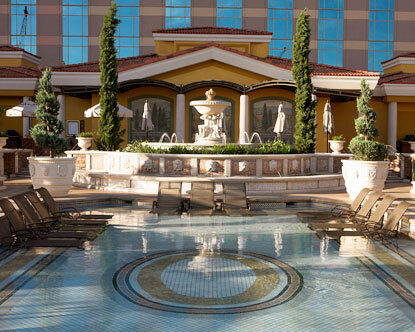 The Venetian Las Vegas pool deck also offers a hot tub and plenty of lounge chairs to relax. Attentive staff members are on hand to offer help with the chairs and towel service, while lifeguards are on duty at the pools at the Venetian Hotel, ensuring everyone is safe. Whether you prefer a large resort style pool or a smaller more intimate setting, the Venetian Palazzo Pools will suit your pleasure. 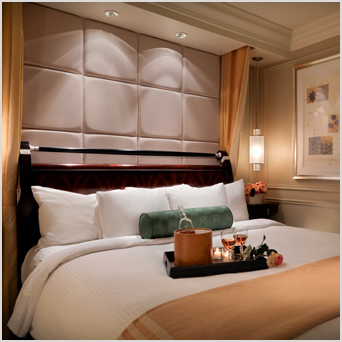 Luxury Suite – 1 King Bed: Every reach of your eye will be met with grace and beauty, while enjoying comfort in a relaxing atmosphere of our 36-story, all-suite resort. From the Roman tub, plush king-sized bed with Egyptian cotton sheets to the sunken living area complete with HD TVs and plush furnishings, you are living the good life. The Piazza Suites emit grace, elegance and the highest levels of comfort you’d expect from a five diamond resort. 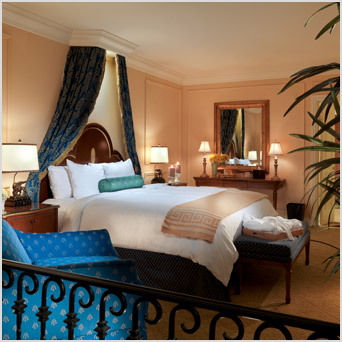 This impeccable suite features a king sized bed with body-soothing Egyptian cotton sheets, and a jetted tub with separate glass-enclosed shower. Gourmets are spoilt for choice with ten fine dining restaurants and a selection of nine casual dining locations. Fine dining includes Tao, which specializes in Chinese, Japanese and Thai. As well as delicious dishes, it also serves up a popular Las Vegas nightclub. The Asian Zen décor includes a huge Buddha and waterfall as well as a Koi-filled infinity pool. Chef Tom Moloney heads up AquaKnox, an eagerly-awaiting seafood emporium, serving fresh fish flown in from around the world each day and a much recommended Raw Bar. Casual dining options include Canyon Ranch Café and Grill which serves up healthy bites such as sandwiches and smoothies. Or, for a taste of Italy, Enoteca Otto Pizzeria is the second of Mario Batali and Joe Bastianich’s two Las Vegas restaurants. It sits on The Venetian’s Piazza San Marco. The Grill at Valentino, Tintoretto’s, Trattoria Reggiano, Valentino, Riva Poolside and Zeffirino. In October 2001, the Guggenheim Hermitage Museum opened within the resort, featuring its first collection. 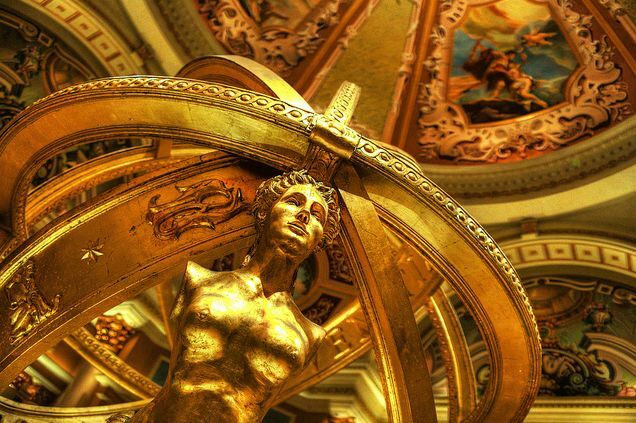 For a brief shining moment it looked like art was going to be the next big thing in Las Vegas casinos, soon there will be only one Las Vegas Strip museum now (the gallery in the Bellagio) that the Guggenheim Hermitage Museum in the Venetian is set to close on May 11, 2008. In 2001, the Guggenheim opened two Las Vegas museums designed by Rem Koolhaas: the Guggenheim Las Vegas and the Guggenheim Hermitage, located in The Venetian Resort Hotel Casino on the Las Vegas Strip. The Guggenheim Las Vegas closed 15 months later after one showy exhibit dedicated to the Art of the Motorcycle. The Guggenheim Hermitage was a partnership between the Solomon R. Guggenheim Foundation and the State Hermitage Museum in St. Petersburg, Russia. The Guggeenheim Heritage saw shows by Lichtenstein, Johns, Oldenburg, Rauschenberg, Wesselmann, Beckmann, Degas, Picasso, Rubens, Miro, Chagall, Bonnard, Kandinsky, Modigliani and Klee but some say that the New York Guggenheim did not do all it could to help their Las Vegas outpost stay afloat. Others say that even with more exhibits the Guggenheim Hermitage struggled to create community interest. The museum, known as the “Jewel Box”, closed on May 11, 2008. It attracted over 1.1 million visitors with ten exhibitions of masterworks by leading artists from the last six centuries. 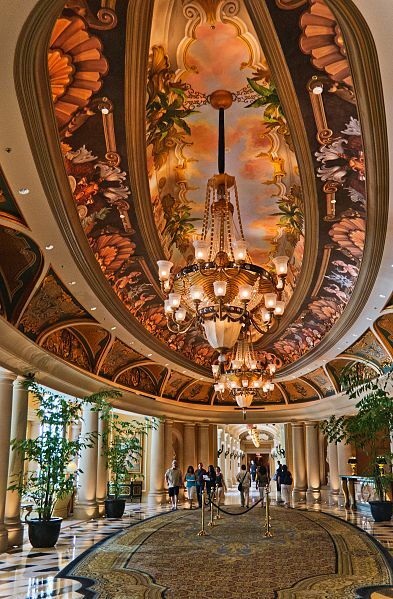 This small, but striking Venezia reception area is located on the 10th floor of the Venetian/Palazzo complex. On June 27, 2003, the Venezia tower opened, adding 1,013 suites and a new wedding chapel. In October 2005, Blue Man Group officially opened at the Blue Man Theatre. On June 24, 2006, the show, Phantom: The Las Vegas Spectacular, opened at a new Paris Opera House styled theatre at The Venetian. The show concluded on September 2, 2012. Currently, Tim McGraw and Faith Hill are headlining their Soul2Soul concert series which began in December 2012 and will end in April 2014. Pass by – have fun!